What does it mean to publish a paper? Is it just to add a bullet point to your CV, or do you want the world to know about your research? What does it mean to publish today? Here are some thoughts and pointers on how to get the word out about the amazing work you do. 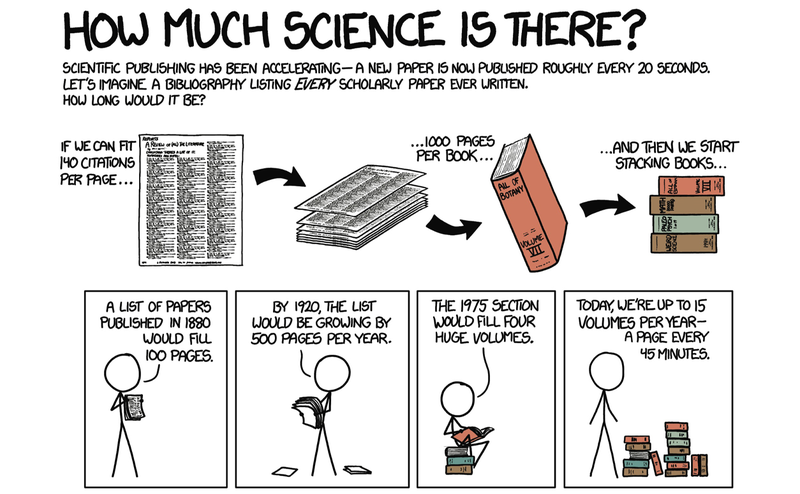 Publishing your results is an integral part of doing science. Why work on figuring out something new if you’re not going to tell anybody? Exchanging ideas, critiquing them, building on them, and then publishing new ones is the way science works. There is another aspect of publication, though: publicizing and socializing your work. You can’t expect people in your field to know what you wrote, just because you published a paper. There’s too much going on even within visualization, and certainly if you try to go outside your narrow field (see this wonderful comic Randall Munroe did for Science in 2013). And yet, it’s still rarely done. Many of the talks I saw at EuroVis recently did not have any sort of URL on the slides. That makes it hard for people to follow up and learn more, and it also makes it hard for me to write about the work. It’s not very interesting to write about some great paper without being able to point my readers to something – anything. If you want me to write about your stuff, you have to have a URL. You may not care about all those random people reading your paper. But perhaps you care about impact? Citations? People in the field recognizing you by your work at conferences? Your fellow scientists cannot cite a paper they don’t know about. If your work only shows up in your publisher’s specialized search, it’s much less likely to be read and cited. Perhaps you subscribe to the idea that publicizing science waters it down or makes it somehow less important. Perhaps somebody told you as much and suggested not to fall in with the blogging crowd. Well, that person is an idiot who is stuck in the 19th century and should not be listened to. We’re lucky to have left that kind of nonsense behind us for the most part. And where we haven’t, it needs to be rooted out as soon as possible. Also, if you’re working at a public university, your work is paid for with taxpayer money. You have a moral obligation to not just sit on your results and do your work for your own pleasure, but to share. What other reason is there to pay you for research? Now that you’re convinced that publicizing your work is a good idea, here are a few things you can do to go about it. Landing page. This is the minimum. Put up a webpage somewhere. I’m not going to tell you where to find webspace – this is 2016. You have a website. Make a page. You’re smart enough to write a paper, you’re smart enough to make a webpage. Put the paper PDF online! It’s so obvious, and yet I’m amazed by how many papers I can’t find online. Don’t expect everybody to have access to the various digital libraries (especially Eurographics is really hard to get to outside of Europe, making your EuroVis papers all but inaccessible). Put it out there where people can find it with just a simple Google search and a click. The more hoops I have to jump through to get to your paper, the less likely I am to read it. Have a blog. I don’t understand why academics don’t blog. I really don’t. It makes no sense. If you have no other reason to blog than to publicize your work, then do it for that! Write a posting once a month. Even if you have a small blog, that likely gives you many times the reach your paper would otherwise have. Make noise on Twitter. The visualization community is pretty active on Twitter. Talk to people. Tweet stuff (and include pictures!). People tend to be receptive and Twitter is a great way to reach a lot of interested people. There are always questions about putting the papers online. The major publishers in visualization let you do that without issue. You’re always allowed to have a copy of your paper on some institutional or personal website. There are some technicalities around whether it’s the final version or not, and whether it’s allowed to go up before actual publication. But in reality, nobody cares and nobody polices this (and what could they possibly do?). So put your papers online if you want people to read them. It’s so ridiculously easy with today’s technology to reach a lot of people with your work. It’s time academics figure out how to use that technology to tell the world about the cool stuff they do. Robert, you’re assuming that everyone’s goal is to maximize the number of people reading and citing their work. Some may want the opposite – to keep their work pure and untouched by the menacingly literate. Many who submit their work to EuroVis clearly prefer their work to be obscure and unknown. Like a music group who exclusively releases on 8-track. Or a restaurant with no sign out front. Just think of them as academic hipsters. They did some research, but you’ve probably never heard of it. Hey Robert, thanks so much for writing this post. I fully agree with you. Here is the thing: we are still living with this terrible legacy by which we are rewarded by publishing as a checkmark activity. Do you have another paper in the top conference. Yay!!! Work done. Let’s celebrate! How do I know this? I know it because I do it. And I have been doing this for a decade now. But it does not take much to understand how absurd this is: what the heck do we celebrate publication?! Publication is not an end, it’s a start! This is the kind of new mindset we need to develop. If you see publication as a starting point, then all you write makes sense. That said, it is also true many of us are still judged by these standards, at least in part. Especially, people who are on the market and are looking for an academic job just cannot afford not having the “right” number of publications in the “right” places. But it’s also true that publicizing your work does not prevent doing the work itself, it’s a win-win. Following the VIS conference in Baltimore 2016, we started gathering websites and other supplementary material that accompany the research papers. Hope this may be a source of inspiration and push for more material published outside-the-paper.